AN CAFE - Major Debut this Summer | VKH Press – J-Rock & Visual Kei Coverage Worldwide! On AN CAFE's website, there was a mysterious counter for a special announcement. On April 1, the band announced that this summer, they will be finally going major after 12 years of activity! The music label Being Group created a new label called White Cafe. The concept behind this is that from starting from white, without any stains, they can have a fresh start and move forward for the unlimited possibilities that await them. White Cafe's first band on the label is AN CAFE. 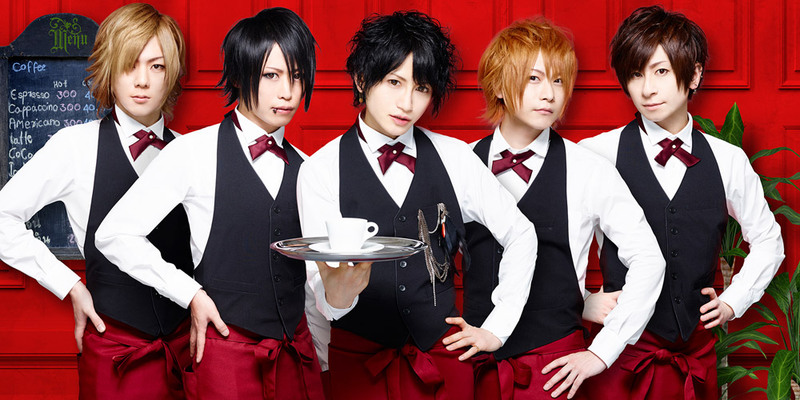 In addition, AN CAFE revamped their webpage to a brand new look, with the members dressed up as waiters in a cafe to match their new theme and style. To everyone who has always supported us, we have an important announcement to make. At this time, we have all decided to take the plunge into a new environment. There's still a bit of fear for the unknown, but all the staff at the office are cheering us on, all the band members are united in building AN CAFE into something great. We will definitely be raising the bar for the band from here on out. From a red cafe to a white cafe... It would make me so happy to add a lot of colors to this white cafe with all of you. I want to be able to continue chasing the fun with you all forever! Kind regards for the future. At this time we've been allowed to work in a brand new environment. Now, more than ever, I feel that the band members, the staff, we have all united, to be able to convey our music to you all. Please continue to cheer us on as we vigorously pursue our future!! At this moment, as we start up something new, there is no anxiety, only belief in the path that lays open before us. We will all do our best to deliver and raise the quality of our lives, our music, and our events. Please wait with anticipation for everything that will come from AN CAFE. This time AN CAFE has taken the plunge into a new environment! So as to not betray the expectations of everyone who has always supported us, we'd really like to liven things up, study our past live performances and try new things! Your continued support is appreciated! We will cherish the AN CAFE we have created up until now. We shall shine even more, and continue on our journey to find even more appeal. Let's go together. When we learn to see a new vision, when we feel new excitement, we want you to please be there with us.